Fish on Prozac? How depressing! DALLAS, Oct. 23 — What could be more peaceful, more restful or more relaxing than dropping a line into a quiet Texas lake and trying to hook a fish that is on Prozac? According to a study by a Baylor University toxicologist, fluoxetine — the active ingredient in the antidepressant Prozac — is making its way to a lake in the Dallas area and into the tissue of the freshwater blue gill fish. BRYAN BROOKS, an assistant professor of environmental studies at Baylor said the fluoxetine most likely made its way through a waste water treatment plant and into a river that feeds into Lake Lewisville, northwest of Dallas. Brooks will present his findings next month at a conference of the Geological Society of America in Seattle. While he has been asked several times about whether fish on Prozac find pleasure in floating aimlessly and no pain when hooked by a fisherman, Brooks said the most important part of his findings are that some pharmaceuticals can make their way through water treatment plants and back into waterways. Brooks said the fluoxetine, and a metabolized compound similar to it, most likely made their way into the water systems from the urine of users or through people flushing Prozac down the toilet. The waste water facility was not equipped to remove the compounds, which then made their way into the blue gills, and perhaps other aquatic life. “If we release something in the environment, we need to understand what will happen to it,” Brooks said. Brooks said his findings lead to a bevy of other questions: How many pharmaceuticals can escape water treatment? Can these chemicals harm the water supply? How widespread is the problem? What long-term health effects might these pharmaceuticals have on aquatic life and humans? But, unfortunately, the nonscientific community seems to be more interested in the idea of fish on Prozac. 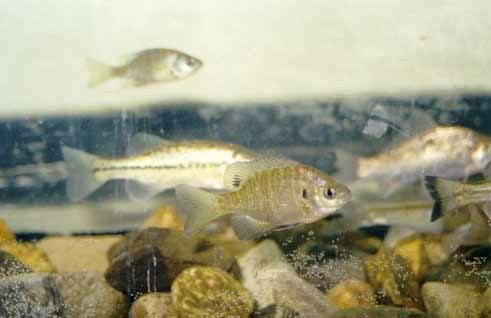 Brooks said the exposure of the fish to fluoxetine is below therapeutic levels. He is studying how current exposure might affect the ability of the fish to find food, fight off predators and find a mate. And if the blue gills were exposed to enough of the antidepressant, the drug would likely have similar effects in the fish that it does in humans. “They would be happy fish,” Brooks said.